Does Redwood outdoor furniture outlive Teak outdoor furniture? The answer to this question can be given in a single word. But, an elaboration on this issue will help shed light on the truth about these two types of wood. To understand the difference between Redwood outdoor furniture and Teak outdoor furniture in terms of their strength and durability, you need to first dig into some facts about them. Let's start with Teak type that grows in rows and harvests in 20 to 40 years rotations in most cases. Top quality Teak plantations require up to 80-year, but they are rarely available. Teak is marketed as a “sustainably harvested” wood type. They are also presented as alternative to exotic woods taken from rain forests. The Teak industry is undoubtedly large and, therefore, it can afford to market strongly this environmental angle. However, this is part truth, part fiction. The truth is Teak does take pressure off the native forests as a source of good quality wood and the fiction is a significant percentage of these plantations are grown on lands that were once forests. Honestly speaking, they are grown all over the world and come largely from the Asian countries. Hence, weather becomes an issue with Teak outdoor furniture in the US, Canada, and European countries. On the contrary, Redwood is largely available in California and across the western states of the US. It is a beautiful wood with an excellent reputation for outdoor durability. They have natural property to resist adverse weather. That is why manufacturers of Redwood outdoor furniture can offer long decay warranty. Redwood furniture manufacturers like Forever Redwood offer its product in 3 grades, and all of them are much superior to other wood varieties available in the market these days. For instance, young Redwood type can last minimum 10-years without any sort of decaying issue when mature Redwood type can continue to possess the decay resistant faculty for more than 20-year. As for the offers of Forever Redwood, all of its outdoor furniture has a 30-year decay warranty. It exceeds the climate durability of any plantation grown Teak! Decay resistance property and structural strength of Redwood are its significant features. So, if you want the longest lasting outdoor wood furniture, you can't help but going with Old-Growth Redwood. 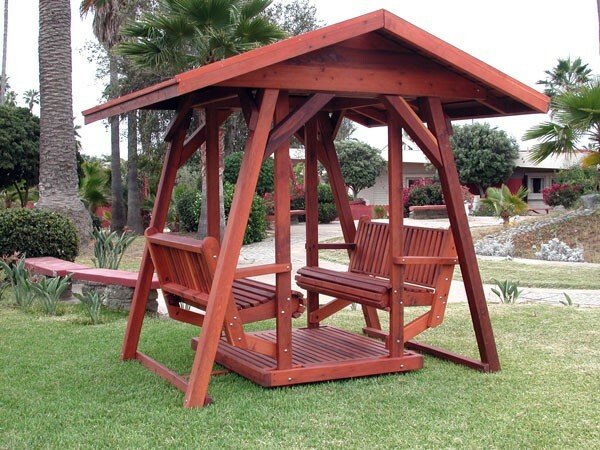 Consider having your outdoor furniture like arched pergolas, picnic tables, wood gazebos, planter boxes, glider swings, wooden porch swings, or outdoor tables or rectangular folding tables - made from Mature or Young Redwood. That's a very nice looking set of outdoor wood furniture - thanks for posting the review! Thanks for sharing this post. It is a very nice blog. Very much helpful and knowledgeable blog about Teak outdoor furniture.